This entry was posted in Reviews on November 5, 2017 by Gareth Prior. This entry was posted in Reviews on February 18, 2017 by Gareth Prior. This entry was posted in Uncategorized on July 24, 2016 by Gareth Prior. 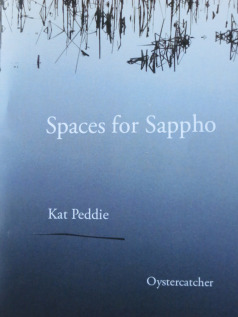 Kat Peddie’s Spaces for Sappho, hot off the press from Oystercatcher, is impossible to categorise (and only an idiot would want to). The pamphlet’s 21 pages contain a mercurial mix of translation, versions, original poems and responses to other translations, all converging on the mysterious absent centre of the historical, textual Sappho. The effect is unsettling, vibrant and seriously moreish. This entry was posted in Reviews on January 17, 2016 by Gareth Prior. This entry was posted in Reviews on October 18, 2015 by Gareth Prior. This entry was posted in Reviews, Uncategorized on August 30, 2015 by Gareth Prior. This entry was posted in Close Readings on June 16, 2015 by Gareth Prior.